Internet FreeBEEs:I have been very busy this week getting our first unit study for the new homeschool year put together (we start back up August 1st). 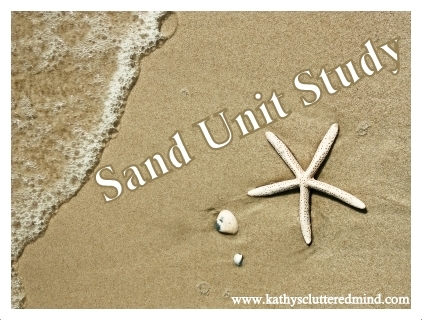 The unit studies are chosen by the kids and when I asked them what they wanted to learn about first Gwyn yelled out, "SAND". Sand really? I was very nervous that I would not be able to come up with enough stuff to cover sand for an entire month. BUT......then my wheels started turning and now I am exploding with ideas. And since the new homeschool year is officially starting I will be changing up my weekly FreeBEE Friday posts a little bit and sharing a lot more unit study resources (FREE of course). It is one of the many homeschooling methods we use (read my Eclectic Learning post) and the kids and I love them. One reason I love units studies is because you can pick one topic and then build off of it. Eventually that one topic becomes a HUGE web and you can cover just about every subject. At first when Gwyn said sand the first thing that came to mind was sand on the beach. But when I started to think outside of the box the unit study grew and now we will be covering deserts, glass, oysters/pearls, animals that live in desert and beach areas........you get the point. With one simple topic like sand we will be covering science, geography, history, art, religion, life skills, reading, writing and more. My kids love watching videos that go along with our unit studies. Here are a few we will be using. If you want to see more you can check out our YouTube channel. -Glass blowing demonstration - I contacted a local glass blowing facility and asked about visiting and getting a demonstration. Guess what they offered to give us one for FREE!!! -Glass fusing - check your local art studios to see if they also offer glass fusing. I was able to get a glass fusing class at My Clayground for FREE because I offered to write a review post about their facility. 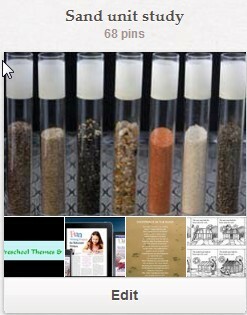 The links above as well as others are pinned to my Sand Unit Study Pinterest Board. If you're interested doing a Sand Unit Study you may want to follow the board because I will be adding more FREE resources as I find them throughout August. *Disclaimer - Many of the links found on my side bars and in my blog posts are affiliate links. As a result, I might get paid money and I will most likely spend the money on homeschool supplies. Please note that prices indicated in the post are subject to change.